NASA conducted another Orion parachute test on Wednesday, March 8, 2017, and the test vehicle performed perfectly. A C-17 aircraft lifted the Orion engineering model equipped with instrumentation to document the test, to a height of 25,000 feet (7,620 meters) before releasing it for its controlled descent. The height and speed were set to simulate the approximate altitude the Orion capsule would be at if an abort from the new Space Launch System (SLS) rocket had to be performed. The speed of the capsule was approximately 130 mph (209 km/h) at chute deployment as compared to the approximately 300 mph (483 km/h) speed the capsule would be at when returning from deep space. After release from the aircraft, two drogue chutes steadied the model before the three 116-foot (35.4-meter) diameter main chutes deployed which carry the capsule down to a safe landing in the U.S. Army Yuma Proving Ground in Arizona. 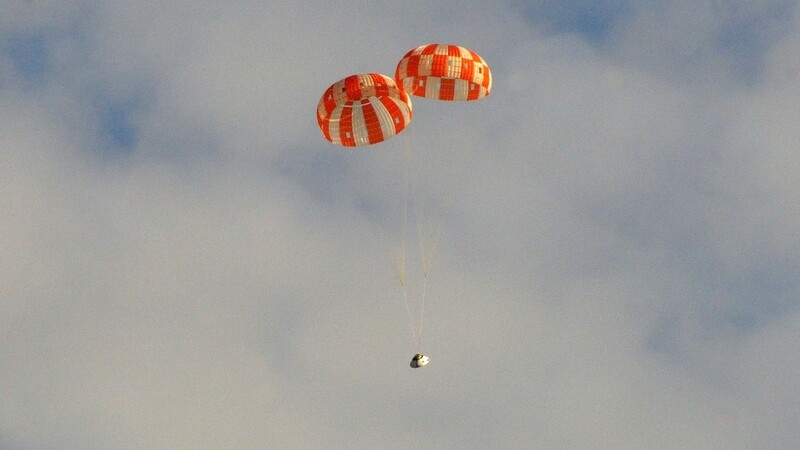 Three parachutes pull off Orion’s forward bay cover, which protected the parachute system from the heat of re-entry, exposing the parachute system to the atmosphere. Then the two drogues deploy to slow the capsule and steady it. Then the three pilot parachutes deploy that, in turn, pull out the three orange and white main parachutes. The three main parachutes could nearly cover an entire football field when they are fully inflated. This is the second of eight tests scheduled to qualify the parachute system for human space flight. However, the parachutes have been tested prior to the human-rated tests during engineering testing. Seventeen tests of the parachute system were performed before the human-rated tests began. 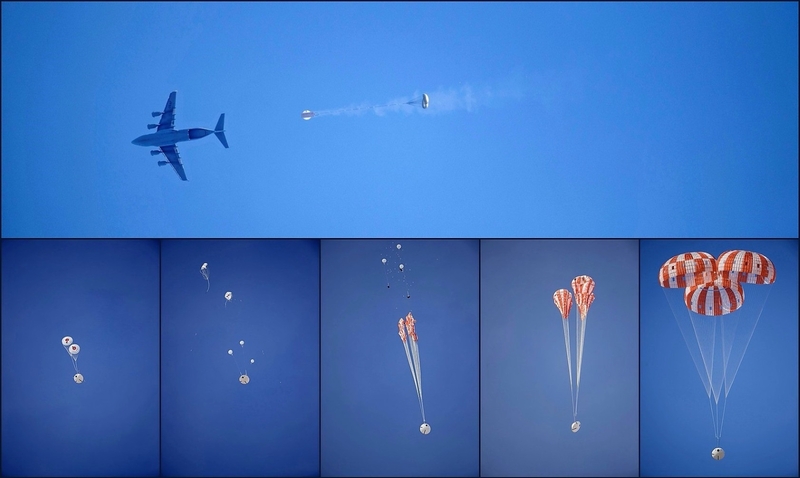 Some of those earlier tests included a parachute failure test on August 26, 2015, when an Orion test article (image below) was released from an altitude of 35,000 feet (10,668 meters) and safely landed with just two of the three parachutes deployed, simulating what would happen if one chute failed like what happened on Apollo 15 in 1971. Also, during the first spaceflight of Orion in December 2014, the capsule re-entered Earth’s atmosphere at a blistering 20,000 mph (32,187 km/h); its parachute system performed flawlessly, bringing Orion to a successful landing in the Pacific Ocean. Although the next flight of Orion is still currently scheduled for an unmanned mission launching on the maiden flight of NASA’s new SLS rocket in 2018, NASA – under a directive from the Trump Administration – is currently investigating the requirements needed to man the mission. Successful completion of the remaining six tests of the human-rated tests of the parachute system will be critical to allow a change to the next Orion flight.